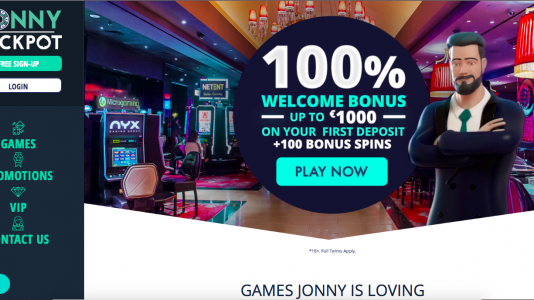 Jonny Jackpot Casino is a pretty sharp looking white label casino which can boast of about 1500 games. The website is intuitive and is pretty well laid out – it’s easy to navigate to find whatever you are looking for whether or not it’s a game from a certain software provider or bonus terms. The are managed by White Hat Gaming Limited which is a fully EU and UK licensed casino brand. We hope to have more information from our members as time goes by. If you have signed up already, please post of your experiences in our forum. If you haven’t signed up – please do and post your experiences as well. The maximum you may withdraw weekly is €5000. VIP players may be eligible for a withdrawal limit increase. Jonny Jackpot Casino has a massive game portfolio: 1×2 Gaming, 2By2 Gaming, Bally Technologies, Barcrest, Betdigital, Big Time Gaming (BTG), Bla Bla Bla Studios, Cayetano Gaming, Chance Interactive, Concept Gaming, Elk Studios, Evolution Gaming, Fantasma, Foxium, Games Warehouse, Genesis, Just For The Win, Leander Games, Lightning Box Games, Microgaming, NetEnt, NYX, Old Skool Studios, Play’n go, Probability, Quickspin, Rabcat, Realistic Games, Red Tiger Gaming, Red7, Relax Gaming, Scientific Games, Shuffle Master, Sigma Games, Thunderkick, WMS, YoloPlay, and Merkur Gaming. They have mostly slots, some table games and live dealers. We are waiting for up to date and accurate payout times from our Meister Minions. At the moment, the casino is listed at a 24 hour reverse time and 48 payout time. 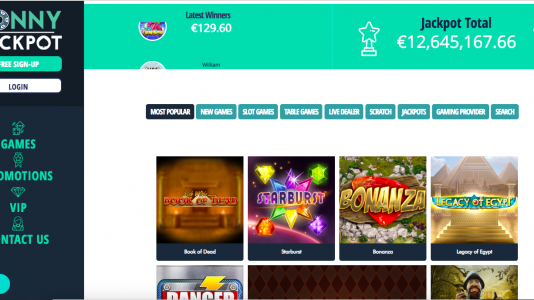 They have a weekly payout limit of €5000., and do not process payouts on weekends. Withdrawal limits may be increased for VIP players. Please ask their support about this. Loads of games to play here on your iPhone, iPad, Android or Windows phones or handheld devices. Jonny Jackpot Casino Terms and conditions Apply. 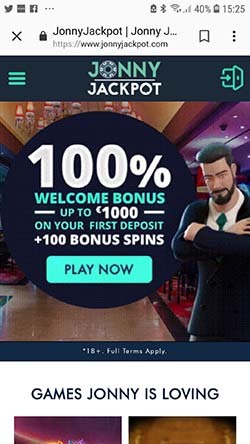 Brand new casino – good reps, nice layout of software – should be a pretty good place to play at, but they are untested yet. You can check them out and post your experiences in the forum.